Sheikh Hamdan bin Mohammed bin Rashid Al Maktoum and Mona Al Marri at the forum. Queen Rania Abdullah of Jordan on Tuesday called on Arab societies to break the ‘mould’ that restricts women’s participation in social development. Sheikh Hamdan bin Mohammed bin Rashid Al Maktoum gives a gold medal to Queen Rania of Jordan. “We share a common challenge - to actively fight currents that are trying to throw us centuries behind. Despite best attempts and achievements, we are restricted by conflicts and backward ideologies,” Queen Rania told a packed hall at Madinat Jumeirah, while giving her keynote address at the Global Women’s Forum Dubai. The Forum was graced by Sheikh Hamdan bin Mohammed bin Rashid Al Maktoum, Crown Prince of Dubai, who presented medals of honour to Christine Lagarde, Managing Director of the International Monetary Fund (IMF) and to Queen Rania Abdullah. Earlier, the dignitaries and delegates were welcomed on behalf of Sheikha Manal bint Mohammed bin Rashid Al Maktoum, President of the UAE Gender Balance Council and Chairperson of Dubai Women’s Establishment (DWE), by Mona Ghanem Al Marri, Vice-President of the UAE Gender Balance Council and President of DWE. “We are honoured and proud to host the Global Women’s Forum in the Arab World for the first time. We are inspired by the path of innovation shown by our leadership. 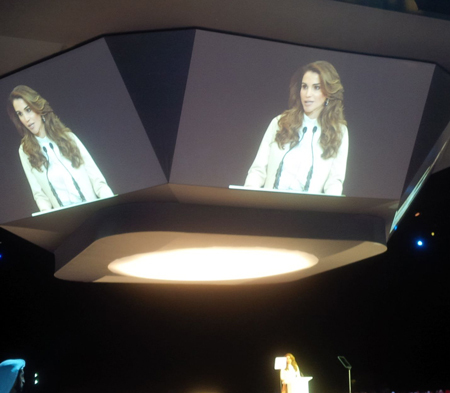 “The future is full of opportunities,” Al Marri said, as she invited Queen Rania to give her keynote address. Queen Rania, following up on the ‘moulds’ that restrict women said: “We have to break the moulds that shape women and girls from the moment they are born. These moulds, which have been passed on through generations, restrict development of a woman’s capability, talent and ambition. We must carefully select from our history and culture the principles that give every woman the opportunity to spread her wings and show us her distinct colours. She said such moulds are based on culture and not religion. “Islam freed women from age of ignorance. They were traders, farmers, warriors and businesswomen,” she pointed out. She said: “It is in our hands – with the promise of modern technology and innovation – to overcome any barriers facing women. “Innovation breaks moulds. Innovation possibilities are infinite. Employ modern technology to create new society,” Queen Rania said while praising the UAE leadership in creating an atmosphere for innovation to succeed. Queen Rania pointed out that any society’s expectations of women directly reflects that society’s potential. “When you empower women you empower the whole society. 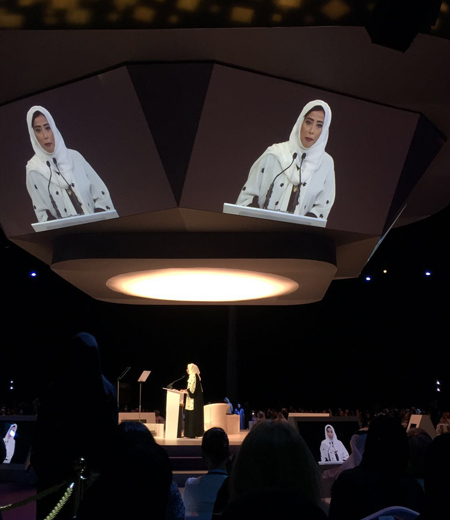 Amal Al Qubaisi, Speaker of UAE Federal National Council (FNC), the first woman to be directly elected to the parliament in the Gulf, thanked the leadership of the UAE for empowering women to play their rightful role in societal development. “This Forum in the UAE is a confirmation of the leading role of women in the UAE and of UAE women in the world,” Al Qubaisi said. She said UAE follows a path of integration between men and women. There is a spirit of cooperation that has created an integrated society to enhance development in all fields. 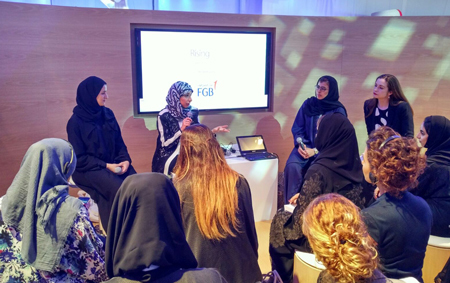 The FNC speaker pointed out that the path of political empowerment of womem in the UAE started not with the founding of the nation in 1971, but much before that in 1955 when the first girls’ school was opened with 30 students. 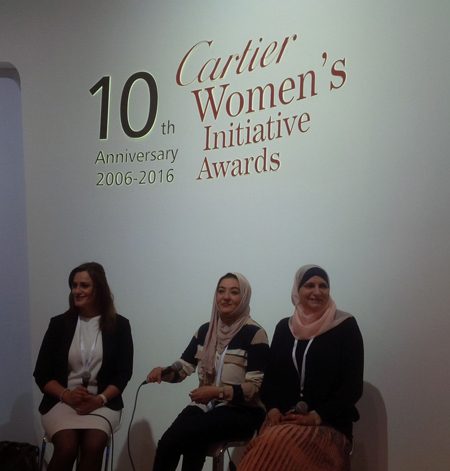 “Education was key to enablement of women,” Al Qubaisi said, while pointing out that the future is rosy. “We dream because we are in a country where dreams come true,” she said. In his keynote address, Sheikh Abdullah bin Zayed, UAE Minister of Foreign Affairs and International Cooperation, pointed out that Global Women’s Forum Dubai is a very important event for the region and the world. “Empowerment of women in the UAE is not window dressing…. it is founded on a serious and organised methodology,” said Sheikh Abdullah. He pointed out that he was raised in a house where his father Late Sheikh Zayed bin Sultan Al Nahyan, and mother Sheikha Fatima – the Father and Mother of the Nation - were partners. He pointed out that it is very important for every country that is serious about developing society, not to exclude any one, any idea, any seed and any type of initiative. 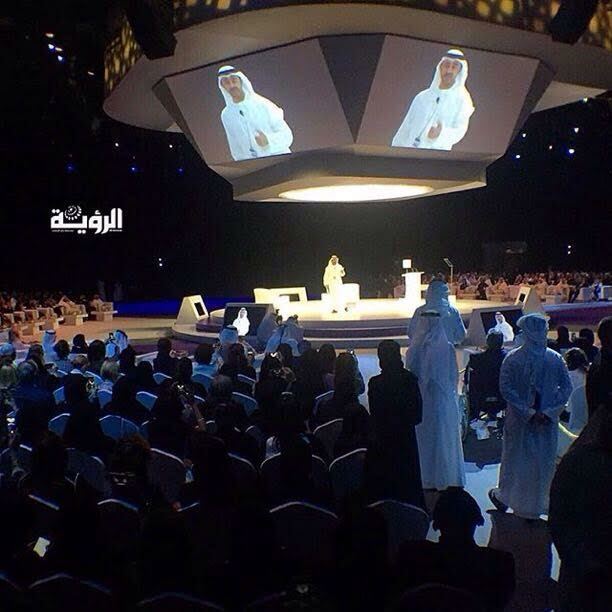 He was confident that the Global Women’s Forum Dubai would enhance the role of women. “The fault is not that women are not working… the fault is that men have taken over the some of the roles of women,” concluded Sheikh Abdullah. Lagarde was asked if she could share the highlights of her five years as the first women head of the IMF. Sheikh Hamdan bin Mohammed bin Rashid Al Maktoum is giving out gold medal to Christine Lagarde, Managing Director, International Monetary Fund (IMF). Second person is Michelle , President of Chile. She had fiscal constraints and had to put in place safety nets to facilitate economic growth. It took me four years, but the US Congress finally approved giving additional support to under-supported countries. Aung San Su Ki… she sacrificed everything to save her country, to save her people in Myanmar. I visited the Zatari camp. It shows what a country like Jordan can do for neighbours who have no place to go. I will never forget an old woman from Syria. She grabbed my hands and asked ‘please help me.’ She wanted to return to Syria. She said she wanted to touch the ground of her country. Europe is unfinished business. It's an extraordinary construction started on the rubbles of war, now facing internal issues. It’s at a crossroads. It’s facing a situation where is it willing to help Turkey, Jordan, Lebanon that is forced to face war in its neighbours. Are we in an economic crisis, she was asked. “We are in a tepid recovery,” Lagarde said. After 2008, which hit us hard, are we still in global recovery? Global economy grew by 3.1 per cent last year. 2017 will be higher than 2016. Recovery in US, Europe and Japan could be better, bigger. India is doing pretty well in emerging markets. China is slowing down deliberately. Brazil will be negative. Q: Why china is slowing down? Is it going soft or hard fall? We aren’t in the business of peace. I wish we were. We’re in the business of economic stability, for people to have a job, for economic well-being. The UAE has a minister of happiness. This is not to make headlines. Economic issues have to be at the table. We can help with good governance, a state that works benefit for people, collects tax… That has to be at same table as the one where you mediate conflicts. I hope that, for the next five years, IMF should be in remedial mode. If we can be more active in prevention mode. If you ask me what my hope for the next five years is, it will be this… We are called when a country is in disaster. We wish to be called before that. And be in collaborative mode. The purpose is to restore peace. Regarding the World Economic Forum in Davos… what are the key challenges? Why aren’t more women interested in science and technology? Some economic scientists contend that aside from electricity and household appliances, there's been no electronic breakthrough. There are not many women, but they are vocal. Combined together, we don't know what massive impact it will have on jobs, on labour market… We will try to participate. It requires massive investment in technology. If women don't have the education level, it won't happen. Here in the UAE, we are in better situation. Speaking of online courses, IMF is online and provides free courses. We have more than 4,000 people in the poor countries who benefit from these courses and graduate every year. On Africa: If we see what is happening today, how are these governments going to provide a good environment? When you fly, u see light everywhere except on Africa. This starts with good infrastructure. If there's no power or reliability of power, you hinder development. Infrastructure requires investments, efficiency of public spending… It’s a double quest. There should be in place governance expenditure to check money actually going to such projects. To see money flows to African territories. This is rock bottom aside for economic development. Question: Did u have a role model? A: We all walk with role models. Mine was my mother. I had difficult relation with her. She was widow at age of 38, with 4 nasty kids. Then professional role model was a single woman law firm partner. In those days, she was my role model. We had to fight all the time. She taught me to keep my head down and stand tall at the same time. Al Qubaisi said that we all should have dreams. We have to engage without being aggressive. Q: How should women break glass ceiling? A: Stand for yourself. Don’t be over aggressive. Pick a champion. You need to have others with you. Form a team. Once up there, maintain networks and be the champ of others. The UAE government is doing an incredibly great job of empowering women. What it can do has set standards for other women. There’s a story to be told for achievement of women in the UAE. Ninety per cent of 143 countries have rules that stop women from rising. Education is not accessible in countries to women than men. Women should be able to access finance. In those areas, policymakers can do a lot. The PM of Japan acknowledged that, for demographic sense, they had to empower Japanese women. "On behalf of all the male colleagues, thanks to Sheikha Manal and Mona Al Marri for hosting this event and enhancing the role of women." "UAE pilot Mariam Al Mansouri was a surprise for everyone. She had other colleagues in the armed forces. "We now see more female pilots. This started 30 years ago. This is not window dressing. It is a serious methodology." "If we are serious and keen to develop our society, we can't exclude anyone. “I was raised in a house with Sheikh Zayed and Sheikha Fatima. They were partners in educating us, in raising us; and developing the country. "These inspiring speeches had a great impact on us. "I would like to say Amal Al Qubaisi is the first woman to win an election in UAE. “I pray for the stability and security of the Arab World,” said Queen Rania. “There is no better place than Dubai to host this forum,” she said. “There's no better place than UAE to entice participation. It competes on international level. The UAE has achieved tremendous gain for women. HH Sheikh Mohammed bin Rashid Al Maktoum, Vice-President and Prime Minister of the UAE, and Ruler of Dubai, was able to achieve tremendous gains for the UAE. In Arab countries, there are many women who became leaders in politics and other public avenues. A society's reflection of women directly reflects on their goals. We have to break the mould for women from their birth. These moulds limit women’s talents. These moulds are based on culture, not religion. We must allow every woman to spread her wings. Islam gave women choices and freedom. With time, we began to curb women’s active involvement in society. To bring about a change in laws is taking time. Changing perceptions could take generations. I didn’t come here to remind you of women’s rights. In the Arab region, the situation is getting more complicated. Extremist ideology has made way into our societies. Many Arab women have faced so many tragedies that their lives have turned around. Winds of conflict face us. There is no doubt that we are stuck on the same ground because of the ideology. We need a powerful push forward. We have modern technology. This can make transformation in education and make changes in society. We promise the modern technology which can overcome many barriers that face women. Tools to give women a powerful voice. I came here to urge you to come together for quick and lasting change. Innovation breaks the norm. Innovation breaks the moulds. The possibilities are infinite. Like the Ala'a Suleiman audio library for the visual impaired. Tahani Rashid has shown us Arab faces in camps. We have two young women appointed as ministers in the UAE. Congratulations. These are examples of pioneering women in the Arab world. I work with hardworking women. I want to help women in my community. They say they want to help women. The instinct god gave women is to nurture and give from our heart. Women are like fruitful trees. Experience shows that success of women encourage success of others. You nurture and they give back. You empower women, you empower a society. In the Arab world, we are in dire need to catch up with global trends. We need strong women. “We are honoured to host this campaign for the first Global Women's Forum in the region,” said Al Marri. Then she invites Queen Rania. “We look forward for a better future for UAE. We look forward to support and unify efforts of the UAE. I welcome Queen Rania due to her international achievements. I would like to extend our gratitude to HH Sheikh Mohammed for conducting this forum for the first time in the Middle East. It’s a confirmation and light of hope for UAE women. The UAE has enabled women on all levels. As we meet here today, we have to remember the vast history of women… for her persistence would not have achieved anything without the efforts of our founding father, Sheikh Zayed bin Sultan Al Nahyan, the leader of the UAE. May god bless the president of the UAE. The present of UAE women is also because of the wise leadership. This exemplary growth in UAE for women wasn’t outside influence. It was an inward vision by its leaders. Allow me to extend our gratitude to mother of UAE, Sheikha Fatima. Words can’t express our pride… she's a source of pride for all Arab women. Women participate hand in hand with men. There is integration between men and women. We build and move towards one society to ensure best international levels for our culture. This will help the UAE to maintain the national identity of UAE. The political enablement for UAE women started before the federation, in 1955 for the first women's school. For more than 20 years, Sheikha Fatima paved the way for women. Women played a decisive role in UAE government with Sheikha Fatima, in 1997, participating in parliament. This is a deserved dream for Emirati women. We dream because we are in a country where dreams come true. From the first election , and today, UAE is leading this legislative bodies. The UAE is a nation of dreams. The FNC comprises of nine women (23 per cent – the highest proportion in the world). They are active in setting legislation… hand-in-hand with male members in the FNC. UAE women also draw general policy of the UAE. UAE women are also appointed in ministries, we have 8 women ministers. All active and young. And highest rate in the world. I remember the first election day… Dec 16, 2006. I was part of the first election day, I was blessed to be one of them. I remember at 8 in the evening, an old man came to me and congratulated me. He said you don't know me, but I came from the western region of the country just to vote for you. His age didn’t prevent him from coming. And when I became a member, one of my colleagues told me that her daughter said ‘Now I am sure that I can reach wherever I want.’ The UAE is such a great country. Any dream is achievable. Old and young believe that dreams are achievable. After graduating from abroad we came back to give back… through educating others. The most important is our role as mothers. Never forget that. Mariam al Mansouri, the first UAE women pilot, dreamed about it for 10 years. And was busy with admin duties, but she never gave up. And she was the only one who was able with her abilities. I asked her, why u are doing this. She answered with confidence that she is a soldier of this country. ‘I am doing my duty,’ she said. We are all playing a national duty to fly into the horizon. Finally, we are proud to be the sons and daughter of Baba Zayed. As UAE women, we have to double our efforts. To set a role model for other women. It remains a beacon of hope. We play our roles with determination. We are creating a future of dreams. To envision Mars through Al Amal shuttle. The UAE has set a roadmap for other countries. There is no distinction between boy and girl. Everyone is participating and building the future. Official welcome and acknowledgment speeches about to begin. Queen Rania Al Abdullah of Jordan and Sheikh Abullah bin Zayed Al Nahyan, UAE Minister of Foreign Affairs and International Cooperation, UAE to speak. IMF's Christine Lagarde to follow. Rama spoke about the lack of educational Arabic content. “I was in Amman, I had two kids and it was difficult to set up,” she says of her journey while launching Little Thinking Minds. “Every journey is personal. It was easy to leave kids with parents,” she says of the family support she was lucky to receive. “The advantage for Arab women is that help is more affordable with maids and nannies,” she says. “We have to rely on outside help to leave home,” she said, adding that she did not ‘have’ to work but chose to do so. Narrating a story about a boy, Nermin said the little child asked his mother: ‘Would you leave your jewellery with the nanny?’ When she said no, he asked, how can we leave me? “While empowering women, let’s not forget our children,” was her message. “I started a virtual engineering company to allow women to work from their own home,” she said. “I had my baby and I realised I couldn't have a career and a family at the same time,” says Mouna. “When my son was one year old, I started my own business,” she recalled. “I created Izil Beauty,” she said, adding that she wanted to manage business in her own time. The business is now extremely successful. “My husband quit his job and helped me manage time too,” she said. “My mother had five kids and a degree [but] she struggled all her time to find work-life balance,” she says. “When I graduated, I started work and got married. My mother made me find an objective,” says Zein. “I got work, studied for my masters and had a baby. Finding a support system for yourself is very helpful to find a balance. My husband and mother were that,” she says. “When I graduated with my Masters, my daughter was 37 years old. To find work-life balance, you need to find support system to give you positive energy. Develop yourself; work for things you are passionate about,” she advises. Rama Kayyali Jardaneh: You have to pay salaries, meeting KPIs (key performance indicators). You work after-hours. You need to remind yourself to take a break, shut off. Nermin Sa’d: Lack of knowledge in business field in this region is a challenge. As a woman working from home, the challenge was to change mindsets of a woman from home. Mouna Abbassy: I studied how to do business. I think it has to be personalised for women… in terms of psychological and emotional. You have to break egos of men to manage things differently. I'm building an international brand, so talk to me as a businessperson, not a woman. Zein Shiyyab: My challenge is finding time to finish a task, be with family. I miss deep sleep. To manage things, I have two kids, they need support. What about myself? Setting priorities is key. Women are emotional so we set priorities for others but forget ourselves. "There's a chance the next UN Secretary General could be a woman." “Resilience, the sheer determination to thrive with little good you have, against all odds. “In UAE, leadership did something remarkable, because of their conviction." "Biggest challenge we face is climate change. Mauritius very high up on the world risk report." "We are going backwards towards to world wars and genocide. "We can be proud of overcoming disaster that no nation can stay on its own. "First time we've had 60 years of peace that Europe has never seen. "Most worrying thing, we are losing our moral values. "Wars come from nationalism, hate, minority intolerance. "My first role model was my mother. She taught me how to negotiate." "She never challenged publicly the authority of my father, but few days later, you would discover, a way to get things done. "She taught me how to endure, compromise. How not to challenge authority publicly." "I was posted in Washington after 9/11, those were trying times. "The Irena campaign, we were telling UAE story of believing in renewable energy. "What we found that being a women across communities in the world, we share a common story. "Expo 2020 campaign was a tough one and we has global competition. "In those thousands of interviews, I came to find myself. "You have to walk the walk and believe what you are saying. "The competition can spot a phony. "You learn also how hard you can fight for your own country's agenda." "World is in a bad state. "I was raised in Denmark, rural, Protestant area. My political party was doing very bad and people asked me if I was a good leader. "I decided I could walk away. But i made an active choice to stay. Fundamental freedom changed it for me." Reem Al Hashimy says: “As we established the federation of UAE, it's became a more established entity. “It is a young country, but we would build a place open to others; a beacon of aspiration and hope. “This region is yearning for this type of hope and ambition. “Women are at the core of this journey, because we need them. “What we have done in this time tells a compelling story. A welcome speech by Clara Gaymard, President, Women’s Forum for the Economy & Society, France, this morning formally opened the Global Women’s Forum Dubai (GWFD), the first ever women’s forum in the region. Thought-leaders and decision-makers from both the private and public sectors around the world are in Dubai to advance the global dialogue on women’s participation, workplace diversity and gender balance over the next two days. “This is a historic gathering,” said Gaymard. “The Women’s Forum isn’t about how the world sees the women, but how the women see the world,” she said. “Let us think global,” she told the gathering. “Our voice matters. We know that healthy, educated and empowered women are the core,” she said. “Yes, men and women are different,” she acknowledged. But we don't want to stereotype,” she said.